Former Indian cricketer Navjot Singh Sidhu has created yet another stir in Punjab politics and this time he has taken a completely new direction. The former BJP MP has gone ahead to form a new political party named ‘Awaaz-e-Punjab,’ in association with former Indian hockey player Pargat Singh, who is also a sportsman-turned-politician. A report by PTI suggests that a formal announcement is set to take place in the coming days. A new poster shows Navjot Singh Sidhu standing alongside Pargat Singh, Simrat Singh Bains and Balwant Singh Bains. Furthermore, the poster features the name of this new political front along with the slogan that it will be “raising its voices against those who have destroyed Punjab,” according to ANI. The poster is in Punjabi and shows Sidhu standing with the other three in a black outfit. For quite some time now, Navjot Singh Sidhu has been in eye of the political storm brewing in Punjab ahead of state elections next year. 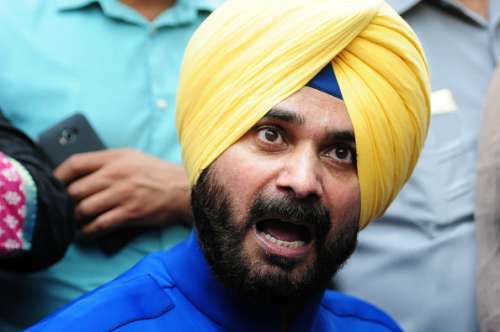 A former member of the BJP, Sidhu took everyone by surprise when he resigned from his Rajya Sabha seat in July to quit the Bharatiya Janta Party (BJP). Political experts and aficionados have been speculating about his next move and there was a lot of talk about him deciding to join Arvind Kejriwal's Aam Aadmi Party (AAP). The Indian National Congress was also in the fray to rope in Sidhu after his exit but it did not happen. It is believed that Sidhu’s wife, also named Navjot, has played an important role in influencing her husband’s decision. However, the forming of a new political front has taken everyone by surprise and it has added another chapter in the never-ending saga around Punjab politics. It is being said that Pargat Singh, an MLA in Punjab, was critical in roping in Sidhu to form a new political front, which would want to stake a claim in the Punjab State Elections in 2017. Pargat Singh is a former Indian captain of the hockey team. A political turmoil has been brewing in Punjab on the backdrop of drug problems and corruption. Sidhu’s exit from Rajya Sabha and the rise of Arvind Kejriwal in the north Indian state indicated towards the former opening batsman heading towards the AAP direction. However, this new move has shocked everyone and is bound to create a stir among the people of Punjab as Sidhu is quite popular in the state.